Czech Republic's Prime Minister Bohuslav Sobotka gives a statement as he arrives for an EU summit at the Europa building in Brussels, Belgium, April 29, 2017. Czech Prime Minister Bohuslav Sobotka abruptly changed tack in his battle to remove Finance Minister Andrej Babis on Friday, taking back a pledge to resign and instead seeking only the dismissal of his main political rival. The country is in political crisis over Babis, a billionaire who faces questions over past business practices but is also the most popular party leader before an election due in October. The battle pits Sobotka's center-left Social Democrats not only against Babis's ANO party but also President Milos Zeman who took Babis's side, something Sobotka said could be overstepping the constitutional powers of the presidency. Babis has had good relations with Zeman and they both see Sobotka as their prime adversary. He also indicated the stalemate is likely to drag on, telling a Czechoslovakia news website that Zeman would consider the dismissal request only upon his return from a trip to China on May 18. FILE - In this March 23, 2016 image, Czech Republic's Finance Minister Andrej Babis gestures prior to a session of Parliament's lower house in Prague, Czech Republic. Earlier this week, Sobotka said he would resign along with his whole government as a way to dislodge Babis. But he changed his mind after Zeman indicated he would treat the resignation as Sobotka's own, not the departure of the entire cabinet. “In such a situation my resignation does not make any sense. The finance minister, burdened by extensive scandals, would remain in the government,” Sobotka told reporters. He accused the president of making “a joke” of the constitution. Sobotka said Babis, worth $3.4 billion according to Forbes, had failed to clear suspicions he avoided tax by buying tax-free bonds from his chemicals and food conglomerate Agrofert. He has also been under investigation over whether he manipulated ownership of a conference center to unfairly qualify for a 2 million euro subsidy meant for small businesses. Babis says he did not break any laws. He transferred Agrofert, which owns two national newspapers, to a trust this year to comply with new conflict of interest legislation. 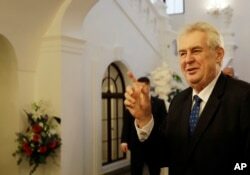 Czech Republic's President Milos Zeman arrives for a parliamentary session in Prague, Czech Republic, Feb. 21, 2017. While a number of lawyers said the constitution implied that if the prime minister resigns the entire cabinet falls, some said it was possible to interpret it so that such a resignation, without a cabinet vote, might mean only the departure of the prime minister. The constitution says the president dismisses ministers at the request of the prime minister, giving the head of state narrow room to maneuver. Babis told Reuters the decision was in the president's hands. “If the president accepts this, then we will see what happens next. Of course it (Sobotka's decision) is a breach of the coalition agreement,” Babis said. If Zeman refuses to dismiss Babis, the dispute may end up at the constitutional court. “There is no deadline, but otherwise (the constitution says that) the president dismisses a government member if the prime minister proposes it, there is no arbitrary power,” constitutional law professor Ales Gerloch told Reuters.